But after my initial jubilation, I had a sudden jolt of nostalgic sadness over the fact that my lunch packing days were over. Okay, if you must know, that passed quickly, but I decided it would be fun to participate anyway. Plus, I’m into healthy environments for kids and a big part of that has to do with what they eat. My kids never bought school lunches. They went to a closed-campus high school and couldn’t wander off to MacDonalds (thank goodness), so over the years, I made a LOT of lunches. And with two boys and two girls, the lunches were often customized and large. I love Ali and Tom’s approach to food, nutrition and parenting, so here’s my contribution to the lunch room party. * I use guaranteed gluten-free oats from Montana Gluten-Free Processors. Oats are generally safe for most people who are gluten-intolerant, but make sure the oats you use are uncontaminated and guaranteed gluten-free. Montana Gluten-Free Processor oats are certified by both the Gluten Intolerance Group and the Celiac Sprue Association. 1. Preheat oven to 325 degrees. Line a cookie sheet with parchment paper. Spread the pecans and almonds in a single layer on the prepared cookie sheet and roast for 6 to 10 minutes, or until fragrant and lightly browned. They burn easily, so watch them and stir once or twice if needed. Let cool. 2. Place flour, ground chia seeds, cinnamon and salt in a food processor and pulse until well combined. Add nuts and pulse until they are coarsely chopped and well blended with the other ingredients. 3. Add oats, apricots and dark chocolate and pulse several times so everything is mixed together. 4. In a large bowl, whisk together egg, maple syrup and vanilla. Make sure these ingredients are well blended. Add the nut and fruit mixture to the bowl. Using a fork, mash and mix them all together, breaking apart clumps of dried fruit and chocolate. 5. Spread the mixture over parchment paper onto the cookie sheet. Either flatten the mixture with your hands or place another sheet of parchment paper on top and roll out into a flat sheet, about 1/4 to 1/2 inch thick. Remove the top piece of parchment paper and bake on center rack of oven for 24 to 28 minutes until nicely browned. Don’t over-bake them. Cool completely on a wire rack before cutting into bars. Store in the refrigerator. Makes about 2 dozen bars. 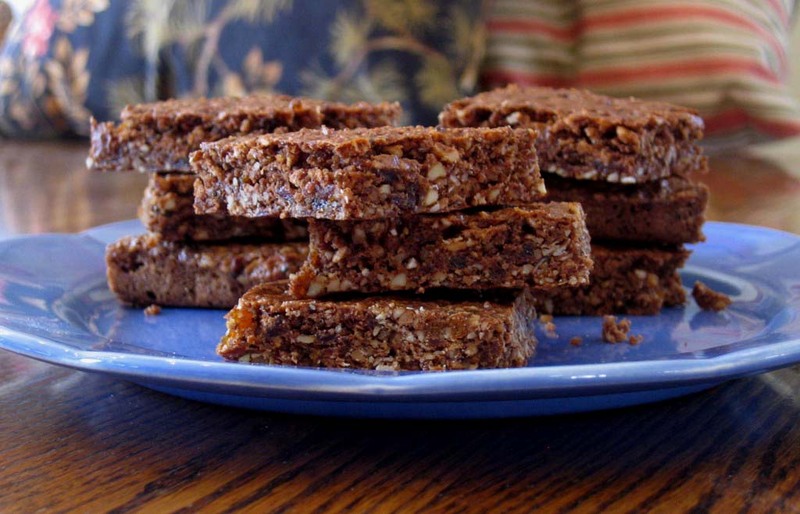 If you don’t have kids at home, make a batch of these and use them for a quick pick-me-up while out hiking or skiing. They make great back-country power bars. Peace, love and good nutrition! This entry was posted on Saturday, September 25th, 2010 at 10:39 am	and is filed under Gluten-Free Recipes. You can follow any responses to this entry through the RSS 2.0 feed. You can leave a response, or trackback from your own site. These look and sound delish! Rounding up some apricots today to make these. Packing lunches was the bain of my existance but I could get a little nostalgic for a second or two! These look delicious. Thanks for your clever comment. I think we’re on the same track with the brush with nostalgia. =) Just a brush. It’s not like I want to start over on that again. Those look fabulous, Melissa! I’ve made something similar for Ali’s GAH roundup. I had a love-hate relationship with making lunches for son. Some days I felt like the best mommy in the world; other days I wanted to bang my head against the wall. And, when the lunchbox came home with food uneaten (and often spoiled), I was not a happy mom. This roundup and your recipe will be such a help to mothers everywhere! So glad you decided to join the roundup. I could eat one of those now, they sound powerfully delicious! I’m in a household where nuts are not favourite food…. crazy if you ask me. I love pecans and hazelnut, brazil and well, anything nutty really. The only thing I might struggle to get are the chia seeds, so those are still a mystery to me but since I like seeds as well, I’m sure to like these. Buttermilk is my latest vintage discovery…. that and the ability to cook up everything from the hedgerows into clear jellies. Do you call these jellies? We eat them with meat and sometimes as a sweet spread. I’m planning to do a herb and apple jelly which sounds good for pork dishes. It’s cold here Melissa, autumn has most definitely set in along with grey skies and rain so I made some warming chai tea this afternoon which was nice. Porridge for breakfast and log fires….. I love it. It’s so nice to hear from you. I’ve been so lax in commenting on the other channel as it’s been a very busy summer. But I’ve missed you all and must join in on the fun again. Pecans are probably my favorite nut. Must be the sweetness (I’m drawn to anything with added sweetness). Keep in mind that if you ever want to try anything that is unavailable where you are, I’ll send you a little “care package” with fun ingredients to play with. Hedgerows? I know what a hedge is. Are you talking about fruit bushes? Berries? Do you make jams or jellies out of the fruit? Or a chutney, which would be more of a meat condiment. I used to make strawberry jam (jelly) because I was living in the mountains at a ski area (right on the mountain) and the ski hills were covered with wild strawberries in the summer. I made lots of jam out of the berries. That was back in my hippie, mountain girl days. It’s been wonderful weather here. Crisp and cool at night, but beautiful bright sunshine during the days. Fall is gorgeous here in Colorado, but a foot of snow could fall at any time. October is usually our first snowfall. Wish I could share some porridge and chai tea with you. Some day! We must make that happen. Missed your comment in my spam folder. Just discovered it. Wonder why I find random good comments in my spam folder. Such is life in the blogosphere, I suppose. Yes, these are delish. Wish I could offer you one with a cup of tea. I’m sure we’d find plenty to talk about over treats and tea. These look awesome for an after school snack! My kids school is nut-free, but these are an absolutely perfect treat for when they get home! Love these. And I am with Shirley… some days I feel like supermom with my lunches. Other days, I feel like it is the same old boring lunch again. Oh well. I am going to make these this week! The power bars look and sound great. I don’t have kids to get lunches for but these would work well for me and my sweet tooth. Something I can just grab and eat. All those nuts make them very nutritious – and probably just a little bit fattening! Nothing that an extra 20 minutes on the morning walk won’t take care of! Thanks for the comment, Dawn. Yes, they satisfy my sweet tooth as well. And you’re right, they aren’t low cal with all the nuts. We forget that often healthy food also comes with a few extra calories. Just something to be aware of. These sound tasty. Especially with the chocolate chips! Yum. Alta, I think high-grade chocolate makes almost everything a bit better. Hi Melissa, what a great looking bar! Excuse me while I drool! Do you know of a substitute for oats for those of us who can’t tolerate those either? These bars sound amazing! What about quinoa flakes? You might try that. I use them in some of my cookies and muffins. They work great. Sorry about the slow response. Somehow I missed your comment. Take care and thanks for commenting. I’m sorry although I looked this up I see a lot of choices and wonder which one you mean. I’m guess ing the brownie one?